WARNING: Your Customers Are Smartening Up On Affiliate Links And So Should You! There Is A Way To Offer A More Presentable Package, And Ensure A More Convenient And Efficient Marketing Strategy In The Process. Your enterprising spirit must have led you to sign up with a variety of affiliate programs that can be found all over the web. A lot of you may even claim to be making a very handsome income by virtue of these affiliate programs. What I am about to share concerns those NETrepreneurs who are making a killing with affiliate systems, as well as those who can't seem to maximize the avenues offered by these wonderful opportunities. This would also concern online businessmen who are in a constant pursuit of marketing tactics that would guarantee optimal exposure for the products they are selling. What I am about to share is a secret that not many affiliate programs want to tell you. And why would they desire otherwise? They want to bring you to their fold so that you may help them sell the goods they are offering. Surely, this secret would put a damper on your enthusiasm. But it is a secret that you should know. Because it is a secret that directly affects your earning potential as an affiliate. You want to know this secret? You Are Losing Money By Using Your Affiliate Links! Indeed, joining an affiliate program is by far the quickest and most cost-efficient way to make money online. You can start realizing some profit without having to dole out that much in terms of financial investments. And with the myriad of free marketing channels on the Internet, you can reach out to countless number of people, often, without spending a single cent! But if you think that this does not come at a price, think again! If you think that you're happy with what you're currently earning as an affiliate, I challenge you to think about the amount you're losing and how much more you could stand to earn. People are tired of seeing affiliate links. Affiliate marketing has grown into the beast that it currently is, that people have become wary whenever they encounter blatant affiliate links being advertised. Just go to a forum - any forum - and you'll see what I mean. Online communities have banned the indiscriminate posting of affiliate links. People who actually publish their affiliate links are chastised by other members. Without the exercise of some creative twists, this can mean the death of forum marketing as a viable promotional strategy online. Worse, many article directories are following suit. By now, you know that article marketing is one of the most powerful online advertising campaigns any NETrepreneur can employ. But more and more articles directories are banning the mention of affiliate links in the articles submitted to them. Soon, article marketing may not be an option for your promotional campaigns if you continue to insist using your affiliate links. Information is what fuels the Internet. People will visit websites because they are in search of valuable information. If they are greeted by direct affiliate links, they will just start thinking that you're merely there to sell them some products. Imagine going to a clinic. Will you trust a doctor who is hell bent on selling you a particular brand of medicine, compared to a doctor who will give you the generic name of a medicine and leave you to decide on which brand to buy? The same principle applies on the World Wide Web. If a user visits a website populated with affiliate links such us affiliateprogram.com/?affiliatenumberone or affiliateprogram.com/redirect?affiliatenumberone, he'll just think that the purpose of such a website is to sell some products instead of offering some good information. But if there will be a direct link to the affiliate program, your visitors will look at such more favorably. After all, there's no way you can earn from providing a direct link. Providing a direct link like affiliateprogram.com, however, will completely eliminate every ounce of earning potential you can derive from the same. What's the use of enrolling with affiliate programs then? Alas, there lies the problem. How can you promote a product on behalf of an affiliate program without resorting to affiliate links? How can you inform the affiliate program that the visitors you'll be driving to its site will come from your efforts? How can you protect the commission that should accrue to your business? Some innovative services have offered to mask your affiliate links. But consumers have smartened up to this tactic as well, it seems. Most affiliate link cloaking services have become very popular, that the sight of their domain name alone can lead people to think that there's an affiliate link behind the same. So, is there hope for affiliates the world over? Can they still promote their affiliate accounts without resorting to affiliate links? It's time to put a rest to your concerns. A solution has been found, one which guarantees the utmost appeal for your links. The Turbo Redirector can be your best partner for promoting your affiliate links, without having to announce that they are affiliate links! An affiliate link normally leads the visitor to the affiliate merchant's sales page. The problem is, people have become wary about affiliate links. 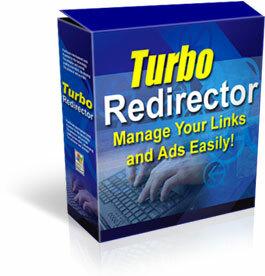 The Turbo Redirector allows you to create a page that will not appear as an affiliate link. The link to this page can be used for your promotional campaigns. Thereafter, when a user clicks on this link, that page loads up, and redirects them to your affiliate link! PLUS: You can add your own LINKS, ads or tidbits of information inside YOUR page! Here's the solution in practice. Supposing you have an affiliate link, "affiliateprogram.com/?yourname." Instead of marketing "affiliateprogram.com/?yourname" and potentially alienating a good chuck of your market, you can use the Turbo Redirector to create a new page under an existing domain name which you control. You can create a page with the link "yourdomain.com/page1.html" for example, and use the same for your marketing campaigns. And when people click on "yourdomain.com/page1.html," they will be immediately be forwarded to "affiliateprogram.com/?yourname." You'll be able to offer a more presentable and attractive link without compromising your potential affiliate earnings! Truly, the wonders that the Turbo Redirector can provide for your business are immeasurable! Just take a look at the fabulous rewards the Turbo Redirector can promise for your online business. You won't have to worry about negative consumer perception regarding the usage of your affiliate links. You'll be able to cloak them better than any kind of masking device! Do you know WHY? Because the REAL & ACTUAL affiliate link of yours will be saved in your database! You can increase consumer confidence by presenting them with absolutely fantastic information and presenting your Turbo Redirector-made link as a supplemental resource. This is a great way to pre-sell the affiliate merchant's products, and the best part about it is that your visitors won't even know that you're pre-selling some products to them! Ask any veteran marketer and he'll tell you that the best pre-sell tactic are those that are offered organically, that is, without pretense that you're after their dollars. You can maximize your article marketing campaigns. You can include your Turbo Redirector-made links in your articles (even in the bodies thereof!) and the article directories will accept your submissions because there will be no showing of affiliate links. In the same light, you can also maximize your forum marketing campaigns. Moderators and other members of online communities won't even see your cloaked affiliate links, and you'll be able to generate a lot of traffic from those sources. Since you will be able to go around several restrictions about the usage of affiliate links, you'd be able to leave your Turbo Redirector-made links all over the Internet. The result? Your link popularity will soar, and your commissions can increase! The Turbo Redirector is more than just a mere link forwarding service. It's a powerful engine also makes it a marketing workhorse, even for the products you are selling yourself! Let's take a look at how the Turbo Redirector is operated so that you'd get an idea about the many other applications you can find for this program. The Turbo Redirector only requires 3 easy steps so that you can enjoy the amazing benefits it promises. That's 3 easy steps that even your son or your daughter will be able do! 1. 1. Log on to the admin panel. 2. 2. Create a page, aka. Redirector. 3. 3. Upload the page on your server! No knowledge of HTML, XHTML, CSS or other web programming languages is necessary! You can create redirecting pages in, literally, under a minute! With the Turbo Redirector, you can create a set of two advertisements. While the redirection is in progress, your visitors will be able to view two ads for your other products, one on the header, and one on the footer. This gives a lot of exposure for your other offers to the audience that is originally interested on the main link. 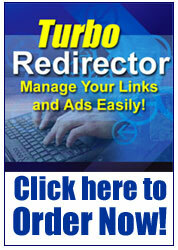 With the Turbo Redirector, you can choose to protect your affiliate links. You will be able to hide the link in YOUR database on the server; thus you don't have to write complicated scripts for the same. All you have to do is to click on the feature that allows such. Protecting your affiliate links from plain view guard against dwindling consumer confidence for the reasons we have stated above, and also guard you against the dangers of link theft. You can choose to protect your redirecting link as well as the links for your other ads. With the Turbo Redirector, you can edit all the settings on the fly. You won't have to take a page offline to make some adjustments. You can do so anytime, and with absolute ease and convenience at that! But the Turbo Redirector offers so much more! You may have subscribed to some services that offered the creation of forwarder pages before. But the Turbo Redirector is much more than this. Oh... it's so much more than a mere forwarding page! If utilized correctly, the potentials of the Turbo Redirector are quite limitless! It can be your very own portal for all the products that generate your income streams. You can create a superlative network composed of all your campaigns, and you can lock your visitors within that network and guarantee for your business the best exposure possible in the World Wide Web! A lot of products claim to be the best. But only a few can back up such a claim. The Turbo Redirector does not make this claim. It rather lets its features do all the talking. Turbo Redirector is a PHP/MySQL script that can be installed on any server! A DETAILED online Manual is also included! The Turbo Seal of Quality comes with the product and this means a commitment to customer satisfaction. Send in your queries and concerns at any time and full technical support will come your way! We want you to feel proud for this purchase because we know the value of this solution offered. Get the script right now (just click the link below) and start using it. If you're not thrilled just ask for your money back. You have 30 days to decide if this solution is THAT good as described here or not. If at any time in thirty days you decide this script was not what you needed then you will get your money back asap. No questions asked at all.